Just a quick note to keep you all informed. We thought that we could get another show out before the move, but it is quickly becoming apparent that it isn't going to happen. Have a great rest of January and we'll talk to you from the new studio in February. Welcome, fellow Wigglians, to the third season of The Wigglian Way! We can't believe that we're beginning our third year. Thank you so much for listening to the show, we hope that you like it. Info about Aaron Paquette's new podcast. 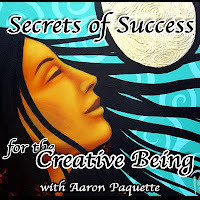 When I was listening to the podcast after Mojo published it I realised that Aaron didn't give any links to his podcast, Secrets of Success for a Creative Being, during his blurb. We didn't either. Here, for your linking/surfing pleasure are a number of links to Aaron's creative side. Hail Wigglians! Welcome to the final show of 2008; what a year it has been; a great, great year here at The Wigglian Way!!! And it's all because of you, dear dear Listeners.